Â· To sketch the radiation pattern Dolph-Tchebyshev array. Â· To compute performance parameters. coefficients are related to Tschebyscheff polynomials. A Dolph-Tschebyscheff array with no side lobes (or side lobes of âˆ’âˆž dB) reduces to the binomial design. 2. Click anywhere on the selection button to its left. Enter desire frequency in the dialog text box, and click Ok or press <Enter>. 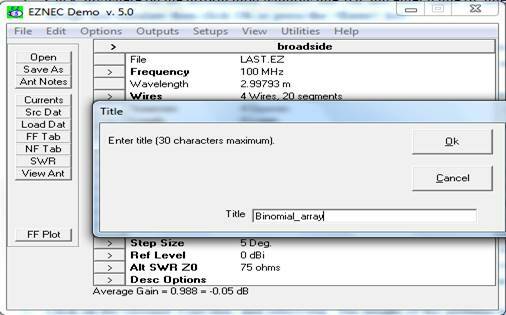 It will automatically calculate wavelength and get displayed into wavelength menu. 3. Open the Wires Window by clicking on the Control Center "Wires" line, or the selection button to its left. Position the Wires and View Antenna Windows for convenient viewing. 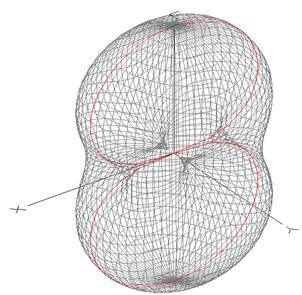 The position of each wire in space is specified by giving its x, y, and z coordinates. These coordinates represent distances from the origin. e.g. for dipole that lies along X-axis at origin of length 0.5m has its X=0.25,Y=0,Z=0 (for end-1); X=-0.25,Y=0,Z=0 (for end-2). The last column is to define the number of segments for the wire. Total 20 segments are allowed for EZNEC-Demo version. 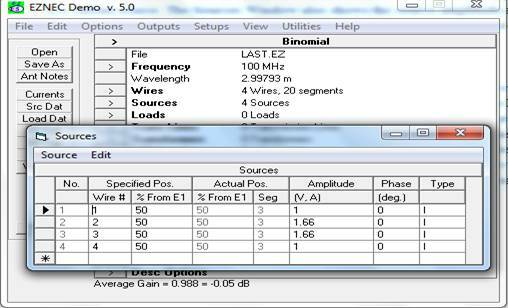 As number of segments increases, accuracy of current distribution and thereby radiation pattern increases. 4. In the Sources Window grid, you can see that there's one source (source no. 1), which is placed on wire #1, 50% from end 1. This is where we want the source to be. However, this is a good time to practice a little with the Sources Window. The source type, shown in the Type column, is a current source. The Sources Window also shows the source amplitude and phase, in this case one ampere at zero degrees. When a model contains only a single source, the magnitude, phase, or type have no effect on the pattern or source impedance. 5. 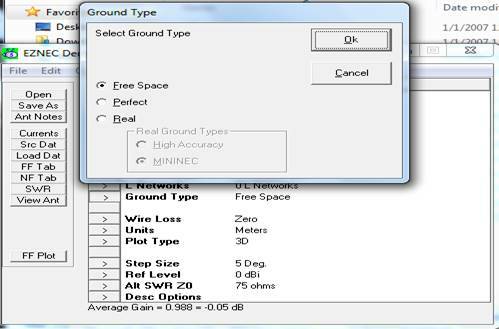 Click on the Ground Type line, and select real. The height of the antenna will determine which ground model we use. 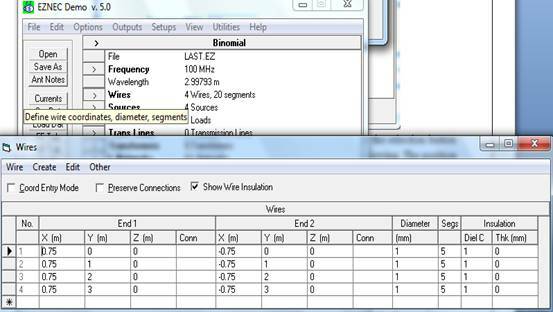 If you have a fast computer, you can always choose High Accuracy analysis unless you need to make a connection to ground. When we changed the ground type to Real, one ground medium was created. The conductivity and dielectric constant of newly-created grounds can be set for your local ground conditions by means of the Control Center Options menu Default Ground Const selection. The values initially used by EZNEC are those of "average" or "good" ground (conductivity of 0.005 S/m, dielectric constant of 13). 6. 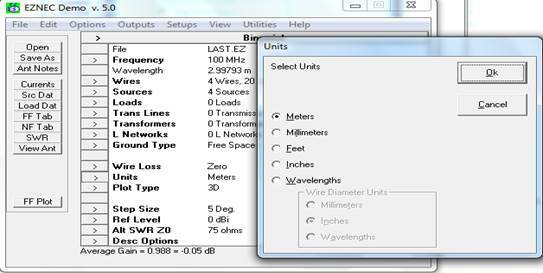 Click on the Units line or the selection button to its left, then select meter, and Ok.
7. 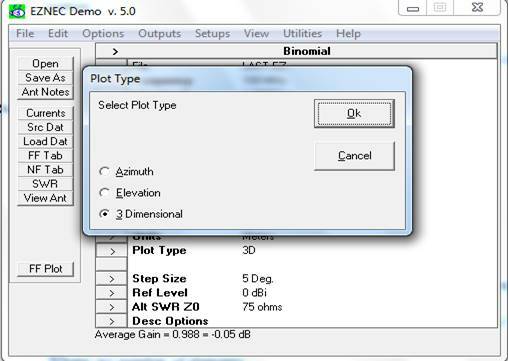 Click on the Plot Type row in the Control Center and select either of elevation, azimuth or 3D-pattern. 8. 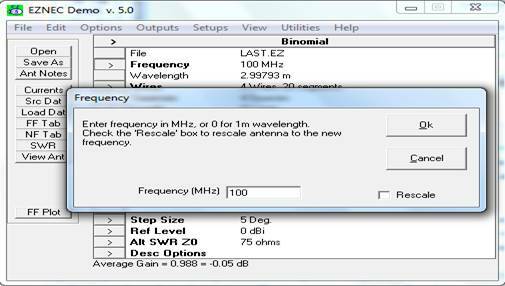 Save the antenna description by clicking the Save As action button. 9. Click the action button. 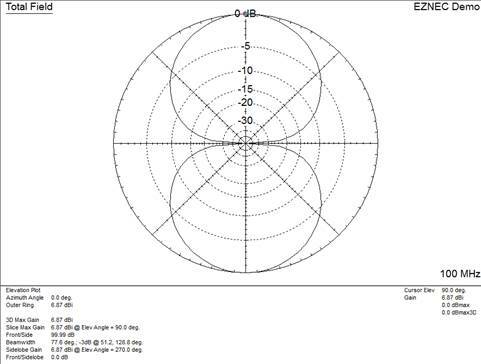 FF Plot; it will show you the radiation pattern and beam width, gain etc. 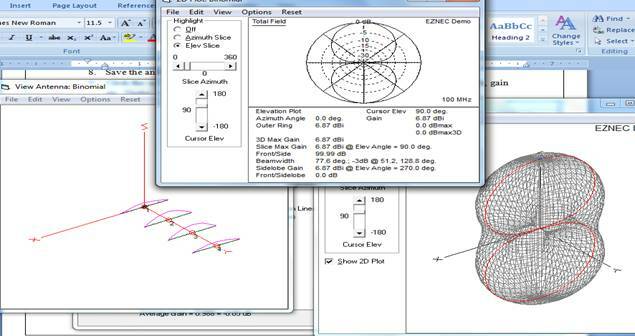 Under view option of 3D plot it is also possible to see 2D pattern of radiation. 2. Length of antenna=> meter. Where, n= number of elements. What is meant by Dolph Chebyshev array? What is the expression for FNBW for Dolph Chebyshev array? What is the expression for HPBW for Dolph Chebyshev array? Differentiate Dolph Chebyshev array and Binomial array? What is the expression for minor lobe maxima for Dolph Chebyshev array?